Under current laws, all workers have the right to stop work if they feel that the work they are doing is unsafe. Some companies have extended this to allow employees to stop work regardless of who is doing the work. An effective stop-work authority policy, when combined with adequate training and the support of management, can help prevent accidents and injuries at work. As with other safety initiatives, it's not enough to simply have a policy in place. To implement this type of policy effectively, we suggest you follow the following best practices outlined by Kyle W. Morrison in the June 2015 issue of Safety & Health Magazine. 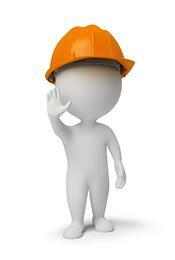 All employees should be properly trained on how to stop work that they view as unsafe. Stop-Work Authority can be difficult to implement because employees may be unsure of what is safe or unsafe. Proper training on hazard recognition should cover safety rules based on OSHA regulations and employer safety policies. Employees should also be trained on the stop work authority policy and how to properly intervene if they see a co-worker in a dangerous situation. Whenever work is stopped, the unsafe work condition should be investigated to determine if a safety hazard is present and corrective actions. The investigation should be done to uncover the cause of the safety hazard and how to correct it. Management should support and thank employees who exercise their stop-work authority. Even in companies with stop-work authority, many employees report being afraid to exercise their right to stop work for fear of retribution or punishment. Peer pressure, desire to get work done quickly, and fear of contradicting their supervisor may also discourage an employee from exercising stop-work authority.